The rulling All Progressives Congress (APC) has dared Senate president Bukola Saraki to reconvene the Senate if indeed he was not perturbed about moves to impeach him. “Like we’ve said before, he will be removed democratically. Let him reconvene the Senate first since he feels we in the APC don’t have the numbers required to impeach him." 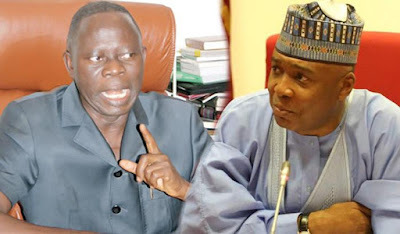 The APC, speaking through its acting National Publicity Secretary, Mr Yekini Nabena, said the party’s position was its response to Saraki’s declaration that he was not losing sleep over threats to unseat him following his decision to dump the APC to join the opposition Peoples Democratic Party. Nabena made the party’s position known to The Punch via phone in Abuja on Sunday. He told journalists, “You can look at me. I am not losing any sleep about it (impeachment threat). We believe democracy must go by the rule of law. Saraki’s spokesman, Yusuph Olaniyonu, had said due process would be followed to reconvene the Senate.